Scientists ran the information through a physics simulation program to see how the allosaurus ate its food. While allosaurus used delicacy and precision in moving its bladed teeth to attack prey, the larger Tyrannosaurus rex was an impressive predator in a different way - it had a big head and massive neck and jaw muscles, Snively said. "Tyrannosaurus rex was like a gorilla with an ice pick, just overwhelming force, whereas allosaurus was more like a surgeon with a scalpel," Snively said. It seems that this dinosaur ate more like a falcon than a crocodile. Sniveley explained that a modern-day falcon called the American kestrel drives its beak downwards into the flesh of its prey, then rips up and back. "Allosaurus had specialized neck muscles that made it really good at doing just that," he said. The dinosaur would hook its head down, sink its teeth in, and tear up and back on the meat, he said. Previous research showed that allosaurus was particularly good at eating like this. The new study advances the picture of what the dinosaur was capable of doing, Snively said. Also building on earlier analyses, Snively and colleagues found that allosaurus must have had a "really weird neck muscle, that gave it really good leverage for driving its head and its teeth down into prey." They advanced this picture by showing just how good these muscles were at this style of feeding. Additionally, the simulation showed that allosaurus's head was quite light, so the head could move very quickly. This would make the creature good at striking rapidly for smaller prey. "Also, if an allosaurus was hangling with a dangerous prey, like stegasaurus, it could bite very quickly and wound the prey quickly without endangering itself so much," Snively said. Allosaurus fed on giant long-necked plant-eating dinosaurs called sauropods, as evidenced by tooth marks on the bones of their remnants. It's unclear if allosaurus attacked them. It may have gone after the bony-plated stegosaurus, but it was probably good at catching smaller prey by whipping its head to the side. 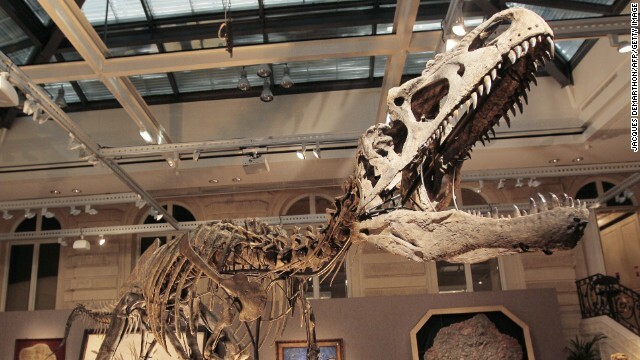 Utah considers allosaurus, which could grow to about 16.5 feet in height and 39 feet in length, as its state fossil. The word means "different lizard." The Big Al specimen has been studied extensively for its feeding mechanics, as well as injury, Snively said. A separate analysis showed that this particular animal had injuries to its ribs and feet, indicating it may have gotten into some scuffles. "This particular dinosaur lived a pretty rough life. We don't know if it got that from defending itself, or from attacking prey, but we do know that it had several injuries that healed," Snively said. In this line of research, the next step is to simulate how modern birds and crocodilians feed, to make sure the scientists' approach works for modern animals, and then see how it applies to other dinosaurs, such as Tyrannosaurus rex. Dear Bible Clutchers: Science is about evidence, based on testing and observation, using calibrated instruments and recognized measurements. Religion is about mythology, beliefs not supported by direct evidence, and a whole lot of "faith" thrown in to help get over the obvious contradictions created by "virgin births" and gods who allow their children to be tortured, nailed to crosses, and used as graven idols. I myself prefer science- it is cleaner, less brutal, less prone to emotional clap-trap, and more interesting. Who wants a 6000 year old world? BORING! Most experts theorize that dinosaurs were gay. Christians always say Dinosaurs were god's experiment then he killed them with an asteroid because.. well i guess they weren't preying enough or something. My opinion is that Christians are a greater evolutionary failure than any other species has ever been. Doesn't matter about facts – they've got a magical story book and a voice in their heads. Ah yes. And finally. How can it be overlooked. I believe that Time, as we know it, did not begin, for man, until Adam ate that forbidden fruit in the Garden. Adam was immortal ! To God, one day is as a 1,000 yrs and vise verse. You and i can never determine how many years Adam lived in the unblemished spirit realm as the time passed for the Earth. Tens of thousands? One million? When Adam ate the fruit is when his "time" began. He lived aprx 630 yrs afterward. Hencefore, we incorrectly think that was that same time God create Adam and thereby, incorrectly, believing that is the age of the world. Further, i ponder, that man could have been created before Adam. It is just that God breathed the Breath of Life into Adam, thereby giving him a spirit as well as a soul. Leading to think that, as scripture says, the sons of God married the daughters of men thereby procreating children with the spirit. All that procreating has led us all the have the spirit from God. That is just a thought though. When God cast Lucifer and his horde out of Heaven, the Holy Bible says, He made a place for them in the bowels of the Earth. I believe that that meteor event that slammed into earth 50,000 yrs ago, was the marking of Lucifer being cast down, resulting in the destruction of the dinosuars and rendering the Earth without form and void. Subsquently, God created man! Teaching the angels about Life. Simple elements, one at a time. We are rational and emotional being, as is God, we are created in His image. What better way to teach the angels but one step at a time. Then gradually adding more to the individual creatures to display their reactions and interactions? God is a Teacher. I think, life with it's emotions and behaviors are His forte. The dinosaurs evolved step by step. And as God increased their makeover, there was the Learning of Life in all of God's complexity. If the dino moved in this way seems more like it would cause blunt force trauma. The church is more at odds with science because the very concept of science is discovery. Nothing in science is absolute. Everything is a theory based off of observations through tests. You never stop testing theories and when you discover a flaw in the theory you need to go back to square one to further understand what you have discovered. In religion there is no need for discovery since things are already known. The bible says the Earth is 6000 years old. If you are a Christian and you think otherwise you are going against your teachings since the bible is absolute truth. You cannot test, experiement, or comprehend absolute truths since there are no flaws in them. Tea Party Patriots believe that the baby jesus planted all those fossils in the ground just to mess with everybody's head. Actually the Tea Party is about fiscal conservatism, no religious dogma. Clearly you have never read up on the movement or gone to the respective websites to read their mission statements. Pretty pathetic you just wanted to attack a group based on our delusional ideology when the article is about science and is in no way political. Tea Party Patriots live in trailer parks, eat at Chick-fil-A and drink Everclear out of mason jars. Religion and politics are the two most commonly sought paths. Both inevitably lead to oblivion. Hmm, almost sounds to me like the dinosaur moved it's head and neck like a snake. Quickly lunging forward and biting and pulling back. Maybe it had some kind of venom like a snake too. I'm just wondering if the neck movements they have described (the ability to dart its head out and back quickly) were for attacking with quick bites, rather than for feeding. i kind of believe they did eat like a bird. Modern humans think big figures,humans etc eats big things. our diets are conditioned to eat more then we need. it doesnt take much eat to get everything the body needs. With large, dangerous prey like sauropods, a quick strike would likely be a wise move. The prey is not going to speed away, and a powerful takedown of such large game would take a much larger and sturdier predator. Attrition, however, would be a workable strategy (used by Komodo Dragons on Water Buffalo and sometimes by Lions on African Elephants). These large animal do NOT die quickly. A quick bite here and there, particularly from a pack or gang, would weaked and eventually bring down even the larges of sauropods. An anti-coaginal saliva or heavy bacterial load (complete untestable from the record, but not unherd of in the animal kingdom) would accellerate the process. After all, once such a large creature was felled, multiple individuals could easily feed enough to last for weeks on a reptilian metabolish. Of course, that is all congecture – there is nothing in the record that is not equally explained by being an oppurtinistic scavanger whose quick heads were designed for small game hunting. What a bunch of crock. The last line tells it all: they haven't checked to see whether their computer simulations mirror what living animals do. So how the heck are they going to say that this computer simulation is accurate if it has no reference point? Sounds like these guys got together one night, determined that it would be really cool if this 6,000 year old animal ate like a falcon, drew some nifty animation on their computers, and called it "SCIENCE." Hogwash, my friends, hogwash. 6000 years old? My guess is that you don't believe in evolution to begin with. If you want to debate religion, please leave this thread. It's about science, not mythology. BAH-HA-HA-HA-HA-HA-HA-HA-HA!!!! *gasps for air* HA-HA-HA-HA-HA-HA!! I *KNOW* isn't that nuts??!? You can't believe everything you learn in kindergarten anymore. Yep! You have a T-Rex ..... *flash forward 65-million years* ..... and now you have a Pigeon. "Yep! You have a T-Rex ..... *flash forward 65-million years* ..... and now you have a Pigeon." Hangling is the result of what suddenly happens when you're gettin' busy with your lady and an image of a naked Joan Rivers suddenly pops into your head. If the earth is only 6000 years old then how could this dinosaur be dated as far back as 150 million years ? Is there any evidence that carbon dating can be off by this absurd amount ? Did isotopes suddenly start to decay at different rates depending who is looking at them ? If this is in fact the case then how on earth can we precisely measure the decay during a nuclear reaction on a nuclear powered sub or a satellite ? If we know this little about radio carbon dating should be really be confident in using nuclear medicine that depends on specific decay rate. Sound like to me there is overwhelming evidence that in fact we do have a pretty good idea on how nuclear decay works. Has any one thought that maybe, just maybe the guy that added up all the years in the bible to come up with this rather arbitrary figure of 6000 years really didn't know what he was talking about. And the Christians wonder why people are running the opposite direction from them when the are gullible to believe nonsense like this. Don't confuse them with facts. Give em a gun and a bottle of rye whiskey and leave them to the delusional thinking. We can start the drug protocol after they are admitted. Ballentine: Life was established on Earth by 3.5 billion years ago (Earth itself is 4.56 billion years old). Don't lump all Christians using the word "Christians". The Catholic Church does not deny the existence of Evolution and does not deny an old Earth/Universe. Cynthia: You are correct. I am the product of a catholic education, in which learning and science were embraced. the problem today is that you will never hear the Church come out and say this vociferously, or take a stand against the ignorance pushed by Bile literalists. I believe they don't want to alienate the Evangelical or fundamentalist sects that are their "partners" in opposing gay marriage, abortion, or the whole "family values"/ religious agenda. Pop Benedict was quite adamant: "Evolution is a fact." He also admonished the faithful to pay attention to the earth and what science had to say, or ignore it at our peril. I am a Christian and I don't believe the Earth is 6000 years old. You Atheists are becoming more and more hateful every day. In almost every article on CNN you write hateful things about Christians and other religions. You say religion causes hate and intolerance, yet you also spread hate, insults and are intolerant to people with other believes. Javier, let me apologize for all atheists everywhere at any time from now until the end of time. Many Christians are good people, mind their own business, and try to live decent lives. It's the pushy know-it-alls, trying to force their beliefs on others, while refusing to accept the facts of nature as revealed by scientific inquiry that we can't abide. However, we don't really HATE the intolerant, or science-denying, or holier-than-thou Christians pushing their personal agenda. We don't hold any of you personally responsible for the depredations and hatred and other crimes perpetrated in the names of various gods through the ages. We actually ascribe to a philosophy of " Love the ignorant, hate the ignorance". I like the new pope. Every time he opens his mouth he shows himself to be intelligent and caring. This is immediately followed some functionary trying to explain how what he said is consistent with all of the narrow-minded traditional teachings of the church. If nothing else, it's entertaining. It's amazing how you but your trust in a science that can claim that dinsaurs where here millions of years ago but can't figure out how old the cannibal is in south america. : principles and procedures for the systematic pursuit of knowledge involving the recognition and formulation of a problem, the collection of data through observation and experiment, and the formulation and testing of hypotheses. What cannibal you speak of? Cannibalism is a cultural phenomenon tied to religious/tribal beliefs or short term food shortages. There are no physical difference between cannibals and non cannibals. The oldest cannibal in South America is no older than the earliest inhabitants of the continent. In regions of dense forest/jungle coverage, finding physical evidence is difficult. Many of those regions have no written language and we can only rely on oral history. Anyway, all humans are capable of cannibalism. Ask the survivors of the Donner party. They responded to a short term food shortage. New word for our vocabulary; "hangling". What does it mean, one wonders?